Charm and mystery. 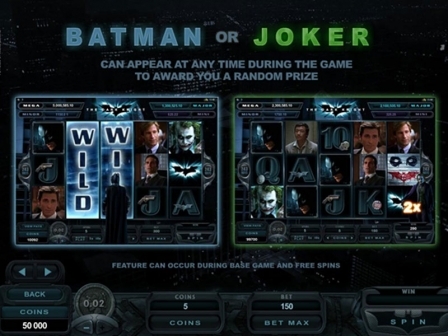 Bruce Wayne's ultimate weapon is here to stun you with its power and prizes. Batman – the Dark Knight slot machine released by Microgaming is another chance to fight with evil... or maybe take the other side of darkness. Cinematic clips, expanding wild symbols stacked on the whole reels and magnetic Free Spins with multipliers. 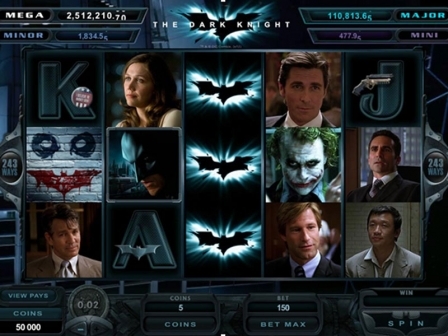 Batman is ready to meet Joker and start real money play. So are you? 243 Ways to Win seems to be enough for you to make the epic heroes live in you winning combinations. Play no download format to meet Joker and put a smile on his mocking face. Again two options to choose from. Only two coin sizes available - $0.01 and $0.02. That simplifies your life full of danger and burning desire to win. Thus, you need just from $0.30 to $6 to play. As you can see, the maximum and minimum options are not so huge to risk your wealth. There are two winning combinations to catch and get the top jackpot of 2,000 coins or $400. You need to collect 5 Wild symbols or 5 Batmen. Yeap. Just catch them on the adjacent reels and prize is yours. Moreover, there are so many ways to your victory. Bat is the Wild symbol. Stacked on the reels these symbols can bring you much more prizes than you expect. To turn everything dark, Bats substitute for other symbols. Only scatters remain untouched. But still they also have their treats for you. 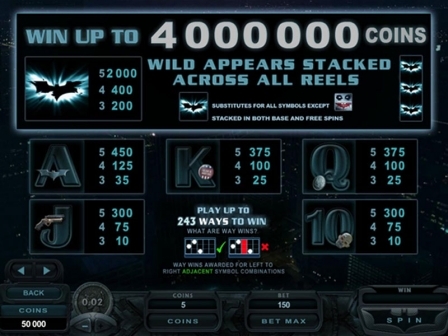 Wild Bat also brings you the top jackpot of the game. Collect 5 Bats and get the best prize. $400 is not a joke! Joker is the scatter symbol. This guy has a tough smile, but still nice prizes. Just catch 5 scatter smiling symbols on the reels and your win $90,000. Of course, it is possible if you play with the maximum total bet of $6. Bloody smile still frozes all the prizes! 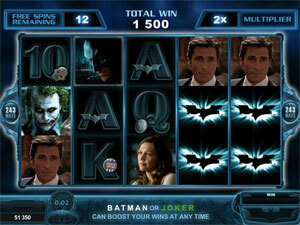 It is Joker smile that activates 15 Free Spins. Actually, you need to catch at least 3 scatter symbols to enter Free Spins feature. All the prizes are multiplied by 2 times. Your top jackpot as well as other prizes will be increased accordingly. Batman has everything. Power, money and adventurous lifestyle. The only thing he doesn't have is peace in his soul. Fight with your demons of every day routine – play online now to reveal darkness. 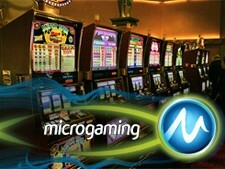 There are 4 progressive jackpots to win – Mega, Major, Minor and Mini. To win them you need to enter special bonus round. It activates at random. So, just luck. Nothing more helps you. Luck and believe in your power. But what would you choose – Dark or Good? Both? Well, actually, this time you need to make a choice. The right one. Batman or Joker. Your destiny is in your hands. 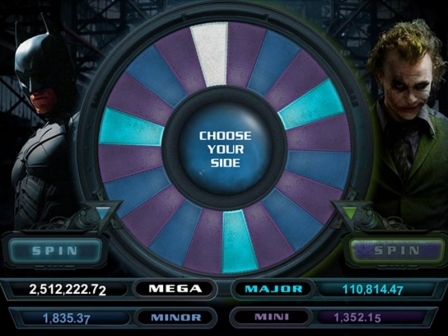 When the decision is made, you need to spin the wheel of fortune. If it takes the chosen side – you win. Such a $1,000,000 decision!